Caleb Brown gets unceremoniously shunted out of the way by Abraham Falani. 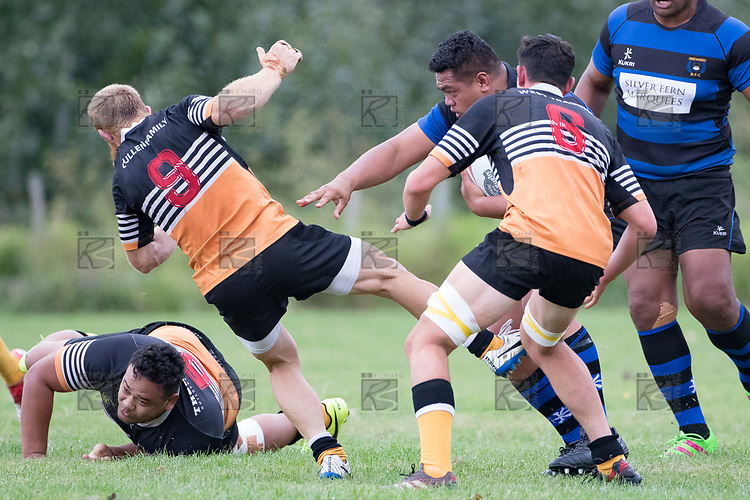 Counties Manukau Premier Counties Power Club Rugby Round 2, Game of the Week, between Te Kauwhata and Onewhero, played at Te Kauwhata on Saturday March 17th 2018. Onewhero won the game 43 - 10 after leading 21 - 10 at halftime. Te Kauwhata EnviroWaste 10 - Lani Latu try, Caleb Brown 1 conversion, Caleb Brown 1 penalty. Onewhero 43 - Jackson Orr 2, Ilaisa Koaneti 2, Vaughan Holdt, Zac Wootten, Rhain Strang tries, Vaughan Holdt 4 conversions.